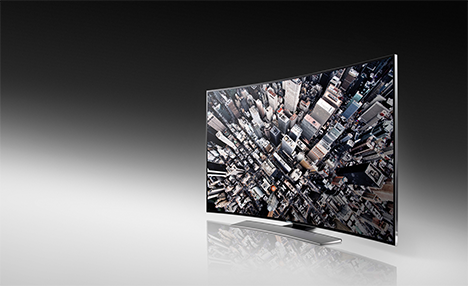 Have you ever sat watching your TV and thought “this is great… but it’d be better if the TV was inexplicably curved”? Me neither – but that doesn’t seem to have stopped all of the big TV manufacturers, who at this year’s Consumer Electronics Show, taking place in Las Vegas decided that “curved” was the new “increasingly massive”. Samsung have today shown off a 105″ curved ultra-HD TV today – to put that into context, 105 inches is massive. And interestingly, is not just widescreen, but is in a “movie theatre ratio” – that is to say, 21:9 instead of 16:9. Whilst this will no-doubt make watching films in 4K (4K is 4x as HD as HD) exciting, it will mean that there will be a couple of black bars down the side of the picture when you decide to use this magnificent display to watch Bargain Hunt. More importantly though… it’s curved. Not to be out-done, Samsung’s Korean rivals, LG have also shown off their take on a curved TV – again, 105″ – but the company claim that their TV is not just 4K… but 5K. Running at a resolution of 5120×2160, they’ll never be any content made in this format – but it’s a nice additional boast I suppose. And it is curved. I’m sorry – I’m not sure what the appeal is of having a TV where it is more difficult for people sitting slightly to the side to watch. Perhaps most bewilderingly Samsung themselves seem to recognise this problem – having also unveiled another prototype curved TV… on which the user can adjust the curvature using a remote control. Why not just have it flat? Surely this is the televisual equivalent of all of those unnecessary extra razor blades, or the tongue brush on the back of toothbrushes? Until TVs are flexible enough for us to fold them away after use… I remain unconvinced.